What Makes Monty Python Funny? America has always had an on-again, off-again relationship with those crazy Brits. Our Nation’s history began with a few harsh feelings between us, but in the time since, we’ve gotten closer, if not friendlier. The British are strange, foreign and yet very familiar; they’re like a funhouse mirror, reflecting ourselves but oddly distorted. For example, they call French fries “chips” and chips “crisps.” Their sense of humor is no exception. The pervading dryness behind nearly every comedic work to come out of England is an interesting contrast to the pervading dampness behind every single object in the British atmosphere. From this dryness, a new kind of humor arose. Likened to the random style behind many American cartoons, but retaining a bizarre sort of structure. Monty Python, the subject of this paper is the most recognizable, a group of pioneers in “Absurdist Humor.” Absurdist humor (also called surrealistic) developed from the avante garde art movement as a distinctly British phenomenon. The main logic behind every Absurdist piece of any genre is the lack of logic contained within; a particularly illustrative example is the Dead Parrot Sketch. In the Dead Parrot Sketch, a man walks into a pet shop, hoping to return a recently purchased parrot. This bird, as could be guessed from the title, is no longer alive, but the shopkeeper refuses to acknowledge what appears to be a simple fact. Citing reasons for the parrot’s inactivity such as: “It’s pining for the fjords,” “It’s resting,” “Stunned,” his insistence borders on the mad for a few sentences and then jumps right off the high dive into our metaphorical swimming pool’s deep end. At this point, the man who entered, Mr. Praline, becomes quite agitated and uses a great deal of euphemisms for death to make it clear exactly how dead the parrot is. The Absurdism within this sketch comes from a single assumption. One expects others to see things as they are, or at least as they appear. The proprietor of the pet store is not a person who could ever exist, at least in normal society, because he is fundamentally “wrong.” Revolving around this one, small change from reality, the sketch becomes an entirely new (and somewhat surreal) experience for the viewers. This sort of thing is very common in the Pythons’ recordings, from the comical overreaction to an innocuous comment in The Dirty Fork Sketch, the martial arts instructor who only teaches how to hold one’s own in single combat with produce in Self Defense Against Fresh Fruit, and a café’s apparent inability to serve anything without a certain potted meat in “Spam.” Most of these sketches can easily be summarized like so: “The Spanish Inquisition tortures a prisoner, but they are completely ineffective at actual torture.” That but is what makes all the difference; The Spanish Inquisition causing someone immense pain isn’t funny at all, but when their most horrific punishment is a comfy chair, most people couldn’t suppress a giggle. 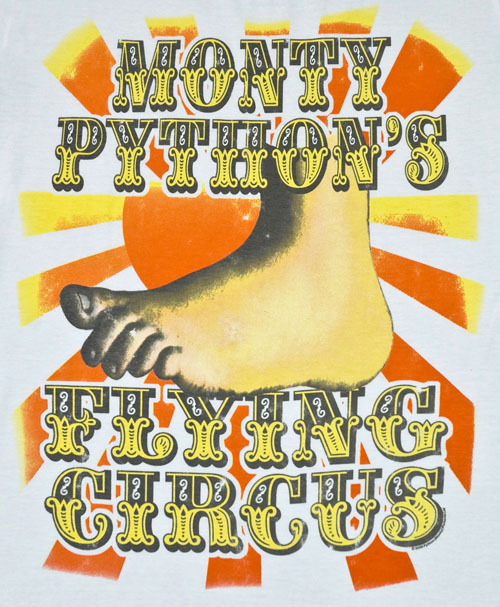 Their own wit, and already present oddness, made Monty Python’s Flying Circus one of the most popular comedy troupes in the world. They are still active today, despite Graham Chapman’s running down of the curtain and subsequent joining of the choir invisible. When they are gone, the world will have lost something incredible. My favorite sketch is the Cheese Shop Sketch. Another fine example of Absurdist Humor.